In its latest review of the global economy, the International Monetary Fund (IMF) revealed that prospects had deteriorated since July with growth for 2015 revised down to 3.1%, mainly due to the slow-down in China. Prospects across the main countries and regions remain uneven and while growth in advanced economies is expected to pick-up slightly, activity is projected to slow, mainly reflecting weaker prospects for some large emerging market economies and oil-exporting countries Declining commodity prices, reduced capital flows to emerging markets, pressure on their currencies and increasing financial market volatility, have increased the downside particularly for emerging and developing economies. The IMF forecast global activity to gather pace in 2016, strengthening in advance economies and improving in emerging and developing economies, in particular growth, in those countries in economic distress in 2015 (including Brazil, Russia, Middle East and some countries in Latin America) while remaining weak or negative, is projected to be higher next year, to more than offset the expected gradual slowdown in China. For the third consecutive year, global grain and oilseed production is expected to produce a bumper 3Bn/t harvest, including a record wheat crop, with slightly lower output for coarse grains, rice and oilseed crops. The large harvest will boost already comfortable stocks and pressure prices across the grains/soybean complex. Since the beginning of the year, wheat prices have fallen by some 20% compared with last year, while a lower corn output is limiting the fall in prices to less than 2%. This year’s theme for World Food Day focused on ‘Social Protection and Agriculture: Breaking the Cycle of Rural Poverty’. Speaking at Expo Milano 2015, the UN’s FAO Director-General Jose´ Graziano da Silva, highlighted the benefits of feeding the world’s growing population, and unleashing the productive potential of millions living in rural areas, where nearly 80% of the world’s poor are found. He said social protection transfers can provide incomes and food to improve the nutrition of the poor requiring a broader perspective and investment in order to meet the 2030 Agenda and the Sustainable Development Goals agreed by governments. FAO has estimated that agricultural production will need to increase around 60% by 2050 to feed the world. Earlier in the year the International Fertilizer Association’s (IFA) slower growth for global fertilizers in 2015/16, with demand expected to expand by 1% year-on-year to 186mt (million tonnes) reflecting, global economic uncertainty, currency devaluations in major fertilizer consuming markets and lower crop prices. The IFA forecast phosphate demand to rebound 41.8mt, while potash and nitrogen to rise more moderately to 31.8mt and 112.9mt, with demand to increase in all the regions except Oceania and Latin America. Since then, the Chinese government’s unexpected intervention to devalue the yuan in August further pressured fragile currencies in several emerging and developing countries, significantly impacting the demand for crop inputs. moderate growth expected to reach 200mt by 2019/20. They forecast the highest growth rates will occur in Africa, particularly Sub-Saharan Africa, where the policy and economic environment in a number of countries is stimulating demand; Latin America, where the cropped area is increasing steadily and in South Asia where phosphate and potash demand is progressively recovering; and potentially West Asia, Eastern Europe & Central Asia, geopolitical tensions permitting; less so in developed countries and in East Asia where China’s new policy to cap fertilizer demand at 1%, per annum, for the next five years, expected to stymie demand. devaluation of the yuan, pushed up the cost of imported (dollar denominated) crop nutrients. Falling nutrient prices reflect weak global demand, tight margins, declining purchasing power among farmers and depreciating currencies of emerging economies. While the build-up of surplus nutrient supplies is exacerbated by falling costs, cheaper feedstock prices (natural gas, coal) and declining producer currencies. Global farm economics still support fertilizer demand, despite weaker crop prices, said Yara’s CEO Svein Tore Holsether highlighting improvements in Brazil, a market which has tripped up many agrichemical groups. The Norway-based group, the world's largest nitrogen fertilizer producer, said that crop prices, are below last year’s levels in dollar terms but still supportive for fertilizer use, while farm margins for fertilizer application, remain supportive overall. Like fertilizers, agrichemicals are also struggling with weak demand and falling profits.With the industry poised for a shake- up, Dow Chemicals boss Andrew Liveris said, "Everyone is talking to everyone," before announcing the company’s forward plan of ‘targeted actions’ with an intense focus on delivering earnings growth and increasing shareholder return. Changes in key personnel have already taken place in leading companies, Syngenta’s CEO Mike Mack resigned and Daniel Leever CEO of Platform Specialty Products, retired days after a second profits warning, while at DuPont a new CEO has been installed. Fertilizer prices continue to show little strength as the fall application season advances; urea prices led the decline (down or the fifth straight quarter) while phosphate and potash prices were lower. Phosphate prices firmed at the end of October, but likely to be affected by poor demand as key importers like Brazil and India cut-back on purchases. DAP was steady at $423.50 at the Gulf (Oct 25); swaps are weaker through winter, which could reduce prices by $30 or more. Farmers so far appear slow to make purchases. Potash prices were steady, lower prices possibly encouraging some demand, as producers cut production, to manage supplies. Macquarie Bank forecast lower potash values likely to average $240/t in the Vancouver export market by the April-to-June quarter next year, down from over $300/t in the August-September quarter 2015, citing a continued situation of oversupply. In Brazil and China, two important countries for fertilizer demand, GDP growth is forecast to be well below the previous three-year average. Many currencies have also depreciated significantly against the US dollar. The Brazilian real has been the worst performing currency this last year, making fertilizer imports, less affordable, but boosting local crop prices and providing positive crop margins. Brazilian buyers are said to be holding out on significant purchases, based on high-beginning stock levels and a subdued agricultural outlook-Brazil’s fertilizer imports expected to decline by as much as 15–20 % year-on- year. Planting of winter wheat for the harvest in 2016 is well advanced. The global wheat area is expected to be slightly lower, but above the average of the last five years. Overall conditions are favourable for winter wheat plantings. Rains are moving through the US southern Plains into the Midwest, with the central and northern Plains also seeing light moisture. Poland, Ukraine and Southern Russia have experienced dry conditions- the arrival of late rains unlikely to help crop establishment as cold temperatures have come early, pushing wheat into dormancy. By contrast too much rain in Hungary has hampered plantings. Despite lower international soybean prices, compared to last year, Marcelo Guima~res deputy director of economics at Brazil's agriculture ministry flagged a potential rise in domestic soybean sowings of some 2.2–2.5%, implying a further increase to the official planted area of 32.6M/ha, with the outlook for crop establishment improving through October, despite some concerns over dryness in major central producing areas including Mato Grosso, and the potential threat to southern Brazilian producing states from excessive rains, bolstered by the presence of El Nin~o. Farmers are encouraged, to plant soybeans, by a weak real (4 reals per U$ dollar), has protected local prices from the international market. Cushioned by the strong soybean price in reals, increases Brazil’s competitive edge on the international market, at the expense of other exporters mainly the US. USDA forecast Brazil’s soybean production to grow by nearly 4% to almost 103mt in 2016. Guima~res told the AMIS food outlook conference that soybean prices could fall to $7–7.50/bu ($257–$276/t), and it would “still be profitable for Brazilian farmers” to plant the oilseed. But he cautioned that farmers are cutting- back on expensive imported inputs like seeds, agrichemicals and fertilizers. Brazil’s fertilizer sales fell in the Jan-Aug period by 1.3mt to 18.6mt. CBOT Futures Nov soybean contract $9.06/bu (22 Oct ’15-04.14). Argentinians will go to the polls again on November 22nd.The business friendly mayor of Argentina’s capital Mauricio Macri won enough votes on October 25, to trigger the first presidential runoff in the country’s history, dealing a startling setback to the populist ruling party. Macri is in favour of scrapping export restrictions on agricultural exports, popular with the farm lobby-a win by him over rival Daniel Scioli may trigger an increase in corn sowings. The current strict export controls on grains, were introduced by the outgoing President Christine Fernandez to shield consumers pressure on storage, farmers are reluctant to sell crops, preferring to store them on-farm until low local prices, reported to be below the cost of production, improve. Despite the potential for higher inputs, in response to increased corn sowings and depleted soil fertility, following three bumper harvests, farmers are holding-back on buying crop nutrients in the hope of future price falls.The global 2015 corn crop forecast 36mt lower at 973mt supported CBOT Corn Futures Dec ’15 $3.79/bu (11.55 Oct 24 ’15) — Corn 3 FOB (free on board) US Gulf $178/t (22 Oct ’15). While currency issues have been a significant hurdle to sales this year,Yara's European nitrate production is benefitting from a weak euro and lower gas prices improving the relative competitiveness of European fertilizer capacity. Based on current forward markets for oil and natural gas, the company’s energy costs for fourth quarter 2015 and first quarter 2016 are expected to be respectively 550m krone and 300m krone lower than a year earlier. While CF Industries and Yara held joint discussions, these were subsequently shelved; CF Industries went on to acquire Yara’s 50% interest in GrowHow, Britain’s largest fertilizer producer, for $580 M in July; and confirmed in August, a new deal with Dutch firm OCI. The deal is expected to encourage expansion outside North America, plus growth in the domestic market, where OCI is building a nitrogen fertilizer plant in Iowa and a new methanol plant in Texas. Global ammonia capacity is expected to rise by 16% from 2014 to 250mt NH3 in 2019 — main additions to capacity will be China, Indonesia, Russia, US, Algeria, Egypt and Nigeria; with a small increase in seaborne ammonia rising by 2% to 18.8mt assuming projects are completed. The nitrate fertilizer market will continue to be driven by the pace of Chinese urea supply the benchmark for global nitrogen pricing, given the record volumes exported over the last year. Prices are also expected to remain undermined by Chinese urea exports, the competitiveness of which will be enhanced by falling prices of coal, a major raw material. The IFA project global nitrogen supply in 2019 at 174mt N with demand for industrial and fertilizer demand to rise by 16mt N to 157mt N. Significant growth is expected in East Asia, South Asia, Latin America with African demand, rising substantially, driven by fertilizer consumption of 4% per annum. Global industrial nitrogen demand is expected to expand by 28% by 2019, compared with a 6% rise in the fertilizer sector potential surpluses accelerating from 10mt N in 2016 to 18mt N in 2019. The IFA expect urea capacity, over the next five years, to be driven by industrial use rising from 55% to 72%. Sixty new units are planned to come on stream by 2019, with 20 units located in China and the remainder located outside China, in countries well-endowed with natural gas reserves. Global urea capacity is expected to increase by 44mt to 252mt — three regions, led by East Asia (35%), Africa (18%) and North America (15%) will account for two-thirds of capacity growth. The IFA forecast global urea supply to grow by 32mt from 2014 to 211mt in 2019. While global demand is forecast to rise to 198.1mt by 2019, significant increase in urea fertilizer demand is seen in South Asia, while industrial urea use is expected to expand in China and Europe. Prilled urea prices FOB Black Sea averaged $268/t through June- Sept, down 16% on the previous year, due to lower production costs, mainly in China. In addition, production capacity has increased, not only in China, with exports expanding from Iran and from new plants in Algeria and Saudi Arabia. While Chinese urea exports at 1.8mt for July/August are below 2.4mt last year, the global market is still negatively affected by exports at 8.5mt (Jan–Sept) up from 6.6mt last year. Production remains restricted for key exporters like Egypt and Ukraine-with buyers unwilling to commit to holding stock, and low crop prices keeping prices soft. Falling nutrient prices, reflecting excessive mining capacity and weak demand characterized by just-in-time buying, in key markets has affected several producing companies. Dry weather has limited crop production in India, a weaker yuan following devaluation together with a new Chinese fertilizer tax and weak economy in Brazil, hit sales. Mosaic, reduced output and laid off workers at their Colonsay, Saskatchewan potash mine in Western Canada, in October, as low crop prices continue to erode farmer demand for agricultural products. PotashCorp also lowered its forecasts for world industry potash sales in 2015 in China, India and, in particular, North America, where volumes will come in at 8.5–9mt, below the 9–9.5mt previously expected and brought forward the closure of its Penobsquis mine in the province of New Brunswick, with capacity for 800,000/t plus three-week shutdowns at three other Saskatchewan mines to improve costs and manage inventories. The combination of the shutdowns and the closure of Penobsquis are expected to reduce the October-December production by nearly 500,000/t. PotashCorp, Mosaic and other potash producers have endured a 17% drop in spot potash prices and are bracing for further declines amid a wave of new capacity. Macquarie expects global potash demand to fall by 4.4mt in 2016; with China holding increased stocks of potash it expects the bias of pricing-power, in future negotiations, to shift toward buyers. Earlier in the year the IFA forecast global potash capacity to expand at a rapid rate, a combination of expansion by established producers and four large Greenfield projects, in Canada, Russia and Belarus over the five year period to 2019. The IFA forecast capacity to rise by 16% 60.8mt K20, with the largest increase expected to occur in North America (Canada), the EECA (Russia, Belarus) and East Asia (China); with supply to increase to 51.8mt K20, while total demand expected to rise modestly to 39.5mt K20 by 2019, leaving a potential surplus, depending on the rate of growth, of 11–16.7mt K20 by 2019. Global potash demand could fall by 8% in 2016, leading to a record surplus as new low-cost projects come on stream. Citing ongoing weakness in agricultural markets and depreciating currencies in emerging markets, Macquarie cut projected potash spot prices by almost 8% to $254/t and to $250/t in 2017. Come next year the bank expects average values at $240/t in the Vancouver export market by the end of June, and sees the prospects for large-scale projects like BHP Billiton Ltd’s $3.8bn Jansen mine in Canada mothballed, in favour of other less capital- intensive projects in metals and energy, unless prices rise significantly; the bank cut its long-term price forecast by 16% to $280/t. By contrast, BHP forecast a deficit for potash supply beyond 2020 as existing mines become non-productive and expect to build the Jansen mine in the next ten years either alone or in partnership with others; they remain confident of the attractive long-term market fundamentals for potash, driven by the requirement for higher yields from arable land to feed a growing global population. Phosphate rock supply is expected to grow by 35mt to 255mt in 2019, Morocco, Saudi Arabia, Jordan and China account for eighty% of the increase. Morocco phosphate rock 70% BPL contract fas Casablanca (Sept ’15) quoted at $121/t slightly up on last year. The IFA forecast Phosphoric acid capacity to rise to 62.9mt P205, with over 30 new acid units to come on stream with over 22 units located outside China. Large capacity additions are expected in Morocco, Saudi Arabia, China and Brazil. Global supply is expected to rise to 51.1mt P205 in 2019, while demand is forecast at 48.34mt P205. Global capacity for the main processed phosphate fertilizers will grow by 7.1mt P205 to 50.4mt P205, China and Morocco will account for 15 of the 30 new units with Saudi Arabia, Brazil and India responsible for the remainder, DAP capacity expected to account for the bulk of the increase. Prices for DAP fell 1% due to weak demand especially in Brazil, while TSP prices were flat during the third quarter. India’s imports have been robust but maybe negatively impacted by a lower rupee, weaker monsoon season (with rainfall estimated to be 15% lower and expected lack of subsidy funding in place for the current fertilizer year. Phosphate production remains below capacity due to curtailments in Tunisia and South Africa. Mosaic is expected to maintain its current slow phosphate production pace, and cautioned that sales would come in towards the bottom of range it had previously guided to. Since the company announced its third quarter guidance on 4 August, domestic and international crop nutrient markets have softened, resulting in lower than expected sales and weaker prices. The company cited slow purchases from key buyers in Brazil and North America, pressure on global fertilizer markets from weak crop prices, making farmers' less willing to spend and hampered by an appreciating dollar, making US exports less competitive against other origins. Phosphates moved lower Gulf prices for DAP fell $1.50 to $428/t, but swaps are down to $400 for November and $381 for January-March; whether prices fall further may depend on whether large-scale producers like Morocco and China cut back production. The global phosphate market remained strong through third quarter with the average US DAP FOB Gulf price down a modest 6% compared to the same quarter last year. Following a substantial increase in Indian import demand this year, the market is currently well-covered, and global DAP pricing has lately come under pressure. The Indian government’s Economic Survey for 2014/15 says there has been improvement in the country’s productivity of foodgrains, pulses and some other crops since the beginning of the new millennium. But whatever the progress, the Survey admits, farm yield gaps between India and the best cropwise available in the world remain wide. This and also major variations in crop productivity among the states in the country underline the “possibilities” of raising volumes of farm production by “increasing the yields of most of the crops,” says the Survey. Agricultural expert Om Prakash Dhanuka says “farm productivity is decided by several factors like quality of seeds, application of nutrients in right quantity and ideal proportion, plant watering either by rains or by way of irrigation and crop growing practices.The issue here in discussion being fertilizer use, let me say not only is the use of nutrients per unit of arable land is low in India but the ratio of their application is highly skewed in favour of urea.” According to the World Bank, fertilizer use in India per hectare of arable land is 157.5kg. This compares poorly not only with China’s 364.4kg but also with 208.7kg for Bangladesh, still a least developed country. Farm experts are worried that use of Di-ammonium phosphate (DAP) in India is considerably lower as compared with urea, leading to imbalanced application of nutrients. Indian farmers are prone to use large quantities of urea, which because of government recommended cap on its retail price is found cheaper than decontrolled phosphatic (P) and potassic (K) nutrients such as DAP and muriate of potash (MOP). The highly subsidized urea is sold at Rs5,360 ($82.42) a tonne in retail market compared with average industry production cost of over Rs20,000 a tonne. Disincentive in use of adequate quantities of P and K is built in the administration of subsidy. He also welcomes removal of cap on neem (azadirachta indica) coated urea production which will go a long way in stepping up the availability of the nutrient. India’s chemicals and Fertilizer minister Ananth Kumar says India is presently using around 6mt (million tonnes) coated urea, but this can now be “raised to the full urea demand of 31mt.” Application of neem coated urea on a large scale will improve land fertility. Dhanuka remains a critic of the methodology of distribution of fertilizer subsidy. As it obtains, the huge difference between maximum retail price (MRP) and production cost of urea is covered by subsidy, which is credited to manufacturers. “In the distribution of urea, there is leakage of fertilizer in the black market. Opening of millions of bank accounts and identity cards in rural India has created the ground for crediting fertilizer subsidy directly to farmers. From the next crop year (July to June) at least, the government should start paying subsidy directly to farmers. This will benefit the farming community as it will ensure effective utilization of subsidy,” says Dhanuka. Subsidy on urea account alone amounts to around Rs800 billion and routinely unpaid subsidy balloons into huge amounts causing distress to manufacturers. Annual consumption of urea in the country is around 31mt while local production mostly through gas based route is 22mt. The shortfall in local availability is met by imports. Fertilizer Secretary Anuj Kumar Bishnoi says “we are looking at a much higher domestic production. So once we have a much higher domestic production, the gap between demand and domestic availability will reduce and so our dependence on imports will be less.” The government has rolled out a new fertilizer policy designed to maximize urea production at operating plants through improvements in operational efficiency, promoting conversion of high cost coal based units into gas based ones and create a favourable environment for building of new gas-based plants. At the same time, creation of a more efficient urea distribution system that will reach urea and other fertilizers in remotest parts of the country remains a new policy goal. A report by Fertiliser Association of India says among the factors responsible for restricted domestic production is “availability of gas from indigenous sources remaining significantly lower than the industry’s requirement of 42.4 MMSCMD. The government has imposed a cap of 31.5 MMSCMD on supply of domestic gas to urea plants.” Because of shortfall in domestic supply, a number of recently converted urea units have come to totally depend on imported LNG. In order to ensure that cost of gas remains identical for all units irrespective of source of supply, the government has introduced “pooling of prices of indigenous and imported gas.” The share of imported LNG in total gas use by urea makers is now as high as 36%. Growing use of imported gas as feedstock for urea plants, near total reliance on foreign origin raw materials for making phosphatic fertilizers and full import dependence for MOP will sustain the country’s thrust to build plants to make fertilizers and their raw materials abroad. As is the practice so far, Indian investments are in joint ventures with local partners in countries such as Oman, Senegal, Jordan and Morocco with production buyback provision. Easing of sanctions against Iran by the US and other Western powers has led India to make multi-project big investment offers to the Persian Gulf country, including the building of a urea plant at Chabahar port adjacent area. In fact, India will also be engaged in further developing the port. the two countries on the price of gas. According to Indian shipping minister Nitin Gadkari,“Iran is offering gas to India at $2.95 per million British thermal unit to set up urea plant at the Chabahar port in Iran. India is negotiating the gas price and has demanded it at $1.5 per mmBtu.” Three India government-owned fertilizer companies RCF, GNFC and GSFC are in the process of forming a consortium to take forward project implementation and its first task will be to identify a local partner with capacity to facilitate project execution. Eshidiya mine into phosphoric acid. This will then be bought by IFFCO for making phosphatic fertilizers in India.” India’s target being to reduce dependence on imports of fertilizers and their raw materials, the search will be on to strike more and more JVs abroad. “JVs in the nature of 50:50 ownership with partners from host countries will underline security in supply of nutrients at all times,” says an industry official. The collapse in Brazil’s currency is making fertilizer, more than two thirds of which is imported, much more expensive. Brazil, which normally imports about 70% of the approximately 30mt (million tonnes) of fertilizer used each year, is on course to buy almost 5mt, or 20%, less of the commodity from abroad this year than during 2014. This is because the Brazilian currency, the real, has fallen by close to 50% against the US dollar in the past year, which has resulted in imports costing farmers close to 60% more than they did a year ago. To compensate for this, the weaker real means farmers are getting much more in local currency for the soya, maize, sugar, cotton, beef and wood pulp they export. So even though the world price of most of these commodities has fallen in recent months, for this year at least, farmers are no worse off and so most have not reduced plantings. In fact, Brazil is expecting an all-time record crop of soya, a crop which uses 40% of all the fertilizer now used for 2015/16, even though its price has increased sharply. This is both because of the increased cost of fertilizer and diesel fuel, much of which is also imported, and also because many farmers have borrowed large amounts in US dollars, mainly to buy more land, so are also having to pay much more to service their often heavy debts. With the world price of iron ore and other minerals having fallen sharply in recent years, and because manufactured goods made in Brazil have lost competitiveness, farm sector exports are now responsible for more than half all Brazil’s export earnings. Farm exports have become crucial in a country where the output of both services and manufactured goods, has plummeted. Because imports have fallen, along with the value of the currency, Brazil is on course to have a healthy trade surplus this year, which is almost the only positive economic news. Apart from agriculture, the rest of the economy is in a mess. Inflation is soaring, recession means unemployment is rising, which is resulting in large numbers of Brazilians having great difficulties in keeping pace with servicing their debts. Many are cutting back on consumption, not least of more expensive foods such as beef, dairy products and processed foods. Because sufficient fertilizer has been applied by farmers in the past few years, yields are not expected to be much lower this year than in 2013 and 2014. Soils continue to contain large amounts of the fertilizer which has been spread in the past few years. However, next year is likely to be a different story. From now on, unless fertilizer applications return to normal — and with domestic production stagnant, that means more has to be imported — yields will almost certainly fall, threatening production. Concerned with the fact that Brazil, the world’s fourth-largest user of fertilizer, after the United States, China and India, imports such a high proportion of the fertilizer it uses, a few years ago, plans were drawn up for investing up to $10 billion on increasing output of the three types of fertilizer used, phosphates, nitrates and particularly of potassium, of which almost 100% of what is needed comes from abroad. It was expected that mining company Vale and oil company Petrobras, which produces virtually all the crude oil and gas used to make certain types of fertilizer, would be responsible for the increases. But both companies have been hit very hard hit by the fall in the price of both ore and oil, while Petrobras has been damaged by a series of serious corruption charges, which have forced it to slash investments. Vale has withdrawn from a major mining project in neighbouring Argentine, which had been expected to result in large imports coming from there. So these is little hope of any increase in domestic output of a commodity which costs about $10 billions to import each year, for many years to come. The economic model adopted 12 years ago by the left-leaning ‘workers party’ which gave priority to increasing the wealth of the less well off, and neglecting investments in infrastructure and industry has run out of steam. Many policies are in the process of being be reversed, but the hard pressed government, whose popularity has plummeted. is having great difficulty in changing course. With the exception of agriculture, the Brazilian economy is set to decline by up to 2% this year, and by the same amount next year as well. Not only is so much fertilizer imported, about 40% of it via the port of Paranagua, in Parana state, most of it has to travel up to 2,000km to farms, notably in the case of Brazil’s leading soya producing state, Mato Grosso. The cost of transport, most done by truck, adds up to 30% to the farm gate price of a tonne of fertilizer. Although gradually more fertilizer is being imported each year via ports in the north east and north each year, as new waterways and railways are gradually opened up, getting fertilizer to farms will always be much more expensive in Brazil as in competitors Argentina and the United States. But the distant centre west is now the only region in Brazil where there is sufficient spare land to plant the extra soya and maize the world will need, and for the extra beef cattle to be raised as well. It is estimated that about 25 million extra hectares will have to be planted to soya and maize by 2025, if supply is to keep up with demand. If more land is planted, up to twice as much fertilizer will be needed, particularly as soils in Brazil are relatively poor. Both cattle, and increasingly commercial plantations of eucalyptus, a commodity demand for which remains very strong and profitable, are using increasing amounts of fertilizer, as new technology, notably the increased use of cloned varieties, allows higher yields, but require more fertilizer to achieve them. Studies have indicated that in the next 20 years, the amount of fertilizer needed in Brazil will have to increase to close to 30mt a year, and with little extra domestic production in the pipeline, most of the extra will have to be imported. Until a few years ago, the trading companies which handle the great majority of the grains, as well as sugar grown in Brazil, used to supply farmers with the fertilizer they need. It used to be exchanged for the commodities farmers delivered to them, in a kind of barter. But because the volume involved and also the amount of money changing hands had become so great, companies such as Cargill, Bunge,ADM and Dreyfus have gradually sold their fertilizer processing plants, most of which are located near ports, to international giants such as Mosaic, and Yara, which are not much concerned with encouraging more production in Brazil, or cutting costs. It’s not easy storing the most corrosive stockpiles in the world — a fact the fertilizer sector knows well, writes Melanie Saxton of Geometrica. The industry faces this reality on a daily basis as they handle organic or synthetic piles of ammonium nitrate, gypsum, phosphate, potash, soda ash, sulphur, urea and manure. The key is to cover these reactive raw materials efficiently — while treading softly around Mother Nature. Quayside, mountainside or in a desert, Geometrica specializes in domes and vaults to cover corrosive stockpiles around the world. It helps fertilizer manufacturers safely store and handle inventories with ‘green’ building solutions that defy caustic agents. Geometrica’s superstructures can be built over operating stockpiles with zero downtime and no loss of productivity. These domes and vaults and have lower overall lifetime costs than conventional buildings, with incredibly flexible design options to accommodate irregularly shaped stockyards, rugged slopes, typhoon-force winds, punishing snow loads and brutal climates experienced in the fertilizer sector. They provide eco-friendly protection against the most hazardous culprits: seepage, bogging, overflow, exposure to moisture, groundwater contamination, saltwater and pollution in oceans. 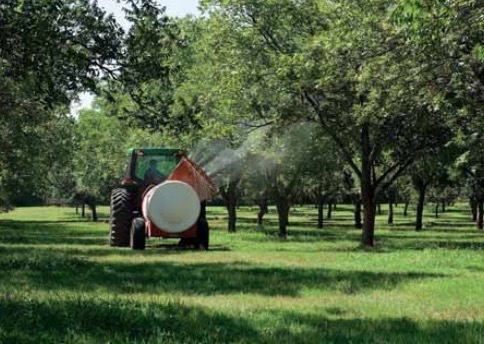 Fertilizer manufacturers face a host of issues. Their piles have been known to wreak havoc on traditional structures inside and out. The materials they handle are often combustible and caustic to the environment. Sulphur, for instance, is known to explode on contact with oxidizing agents and can react violently when exposed to finely divided metals, alkali, and mineral acids. Sulphur also corrodes damp steel and attacks a storage structure’s metallic components. Geometrica domes are ideally suited to these extremes and offer planet-friendly solutions to interior and exterior exposure. The goal, as always, is to help manufacturers responsibly store and handle sensitive raw materials. Geometrica specializes in ‘green’ building infrastructure that defies corrosion while protecting landscapes, crops and communities. The Ruwais sulphur dome, located in the UAE, is an example of well ventilated circular storage engineered for flexibility and customized to suit the project’s specific materials handling needs, site specifications and design preferences. Likewise, urea is another challenging raw material. It must be stored with care, as its storage and salt water exposure combine to torture metal. Geometrica’s domes and vaults overcome such obstacles with innovative design-build applications. For instance, a lightweight skeleton for Grupo CICE was built of high-strength aluminium alloy and left exposed. This Freedome® barrel vault has a revolutionary longitudinal and vertical span protected by FRP underside cladding. permitted other subcontractors to work side-by-side on site. Today the superstructure spans 120m in Veracruz, Mexico and stores up to 15,000 tonnes of urea while waiting for transport. It effectively withstands corrosive attacks from inside and outside the building. ‘Sea coast friendly’ is a good way to describe Geometrica domes in marine environments, from the Gulf of Mexico to Asia’s tropical rain forests to estuaries along various continents. Geometrica’s technology helps portside fertilizer suppliers overcome a very real ‘double threat’ of exposure to caustic bulk combined with the corrosive nature of saltwater. Geometrica provides ancillary port infrastructure for solid bulk materials such fertilizers and coal, which are loaded from the stockpile or unloaded from the ship. The company’s superstructures offer efficiencies with lower initial and lifetime costs — and also stand up to the typhoon force-winds commonly found in such areas. Galvanized-steel dome structures are clad with aluminium sheeting, combining the strength of steel with the corrosion resistance of aluminium, while also meeting National Fire Protection Association guidelines for control of confined dust. On the other side of the world, Geometrica designed a coal storage circular dome for Indonesia’s largest fertilizer producer, PT Pupuk Kalimantan Timur (Pupuk-Kaltim), and met very specific logistical and environmental needs. Pupuk- Kaltim chose to use only clean-coal technologies, including a circulating fluidized-bed boiler, a coal-storage dome and a continuous barge unloader. These technologies had earned recognition for their successful use at the JEA Northside power plant in Jacksonville, Florida (another Geometrica project) and help keep the environment around the facility pristine. Geometrica installed an 81m circular dome requiring a 10m-high reinforced concrete perimeter ring wall to combat typhoon-force conditions, covering 40,000 tonnes of coal, plus a coal stacker and a portal reclaimer. All stockyard operators need efficient and economical materials handling solutions. With spans up to 300m of barrier-free interiors, Geometrica’s domes and vaults make full use of space and can be installed over existing stockpiles with no loss of operations. It designs solutions that harmoniously accommodate traffic, machinery, personnel and inventories. Domes are designed to integrate seamlessly with unloading, conveying, storing, reclaiming, bagging, distribution, control and supervision processes. Geometrica’s corrosion-resistant dome components are prefabricated, pre-sorted, packaged and shipped to sites. They can be installed by local labour without welding, special tools or heavy equipment.